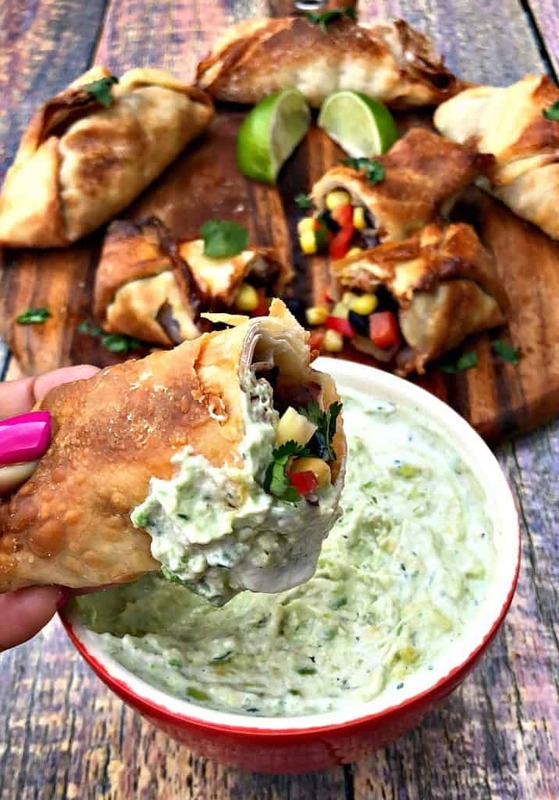 Air Fryer Vegetarian Southwestern Egg Rolls with Avocado Ranch is a quick and easy healthy recipe that rivals Chili’s Tex Mex Southwestern Egg Rolls Recipe. 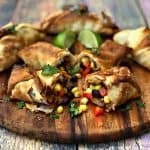 These crispy, crunchy rolls are loaded with black beans, corn, diced tomatoes, red onions, and cilantro. The creamy dipping sauce is loaded with flavor! 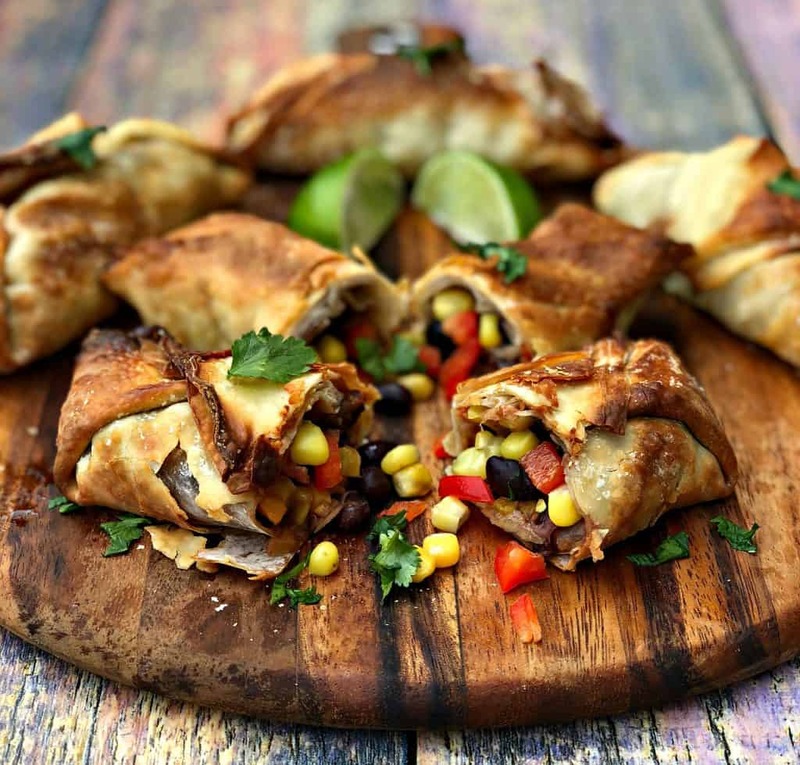 If you love egg rolls, you should try my Beef Taco Egg Rolls as well! A lot of restaurants have variations of Tex Mex egg rolls on their menus. Two that stick out to me are Chili’s and The Cheesecake Factory. If you loved those egg rolls, then keep scrolling, and check out my latest experiment. I love fresh ingredients! I also really like colorful food. You may take one look at that recipe card below and run for the hills because the ingredient list looks long. WAIT! A lot of the ingredients are totally optional. Obviously, omit the things that you do not like. If you are strapped for time and need a recipe with just a handful of ingredients, cut out the items that you aren’t married to! OR….if you love color apps like I do, leave them in. You will love them! Fold the wrappers diagonally to close. Press firmly on the area with the filling, cup it to secure it in place. Fold in the left and right sides as triangles. Fold the final layer over the top to close. Use the cooking brush to wet the area and secure it in place. If you have never rolled an egg roll before, your first one may look like a practice roll. Don’t worry, you will get better with the second one. The recipe ingredient list does not include jalapenos. I used Trader Joe’s Taco Seasoning for this recipe. It already has a spicy kick to it. Feel free to do as you wish. If you want spice, go for the jalapenos! Add them to the skillet when you add the multi-colored peppers. I often substitute sour cream for plain, non-fat Greek yogurt. It also adds additional protein! 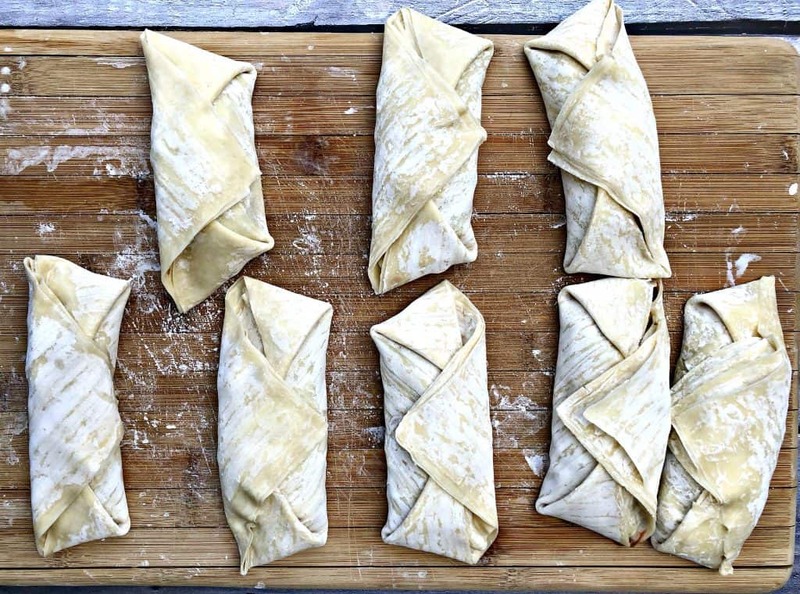 If you need more tips on How To Roll Egg Rolls check out this post. 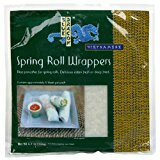 If you need tips on How To Freeze Egg Rolls for future use. Check out this post. 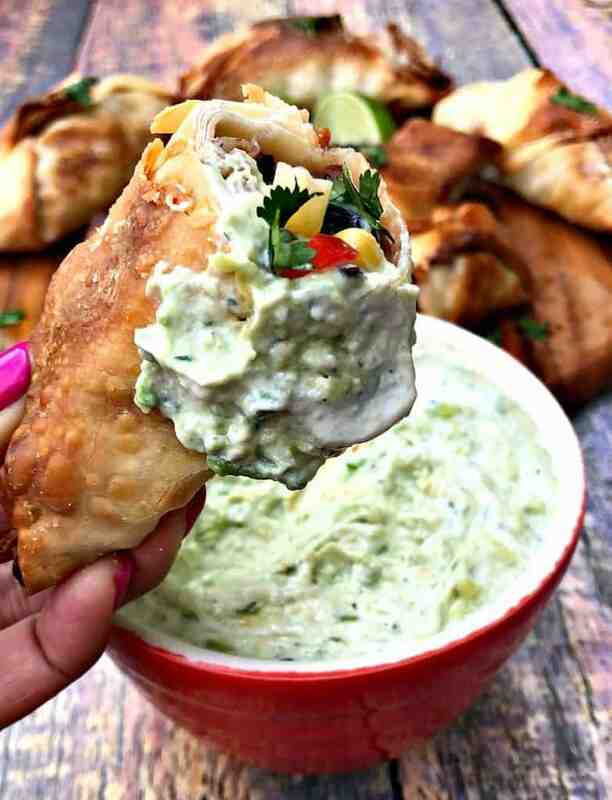 Air Fryer Vegetarian Southwestern Egg Rolls with Avocado Ranch is a quick and easy healthy recipe that rivals Chili's Southwestern Egg Rolls Recipe. These crispy, crunchy rolls are loaded with black beans, corn, diced tomatoes, red onions, and cilantro. The creamy dipping sauce is amazing! Heat a skillet on medium-high heat. Add the garlic and onions. Cook for 2-3 minutes until fragrant. 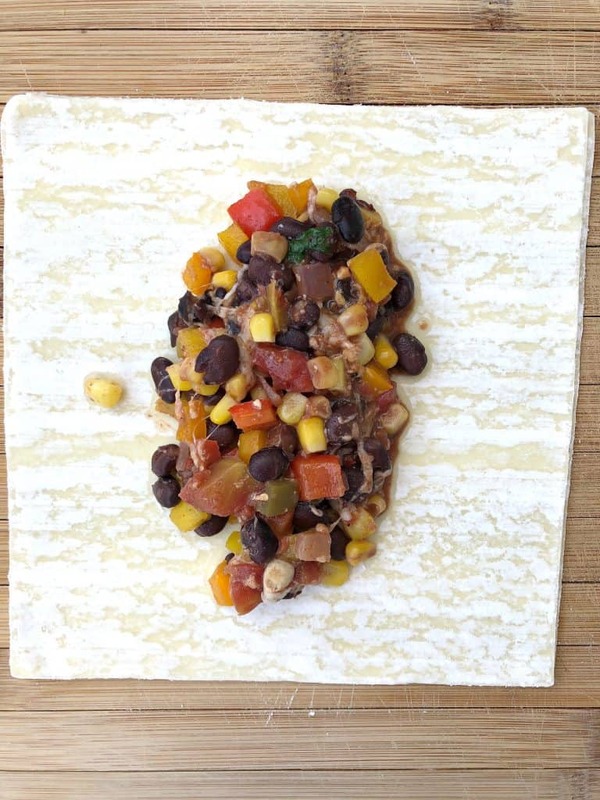 Add the black beans, corn, tomatoes, and cheese. Cook for 2-3 minutes. 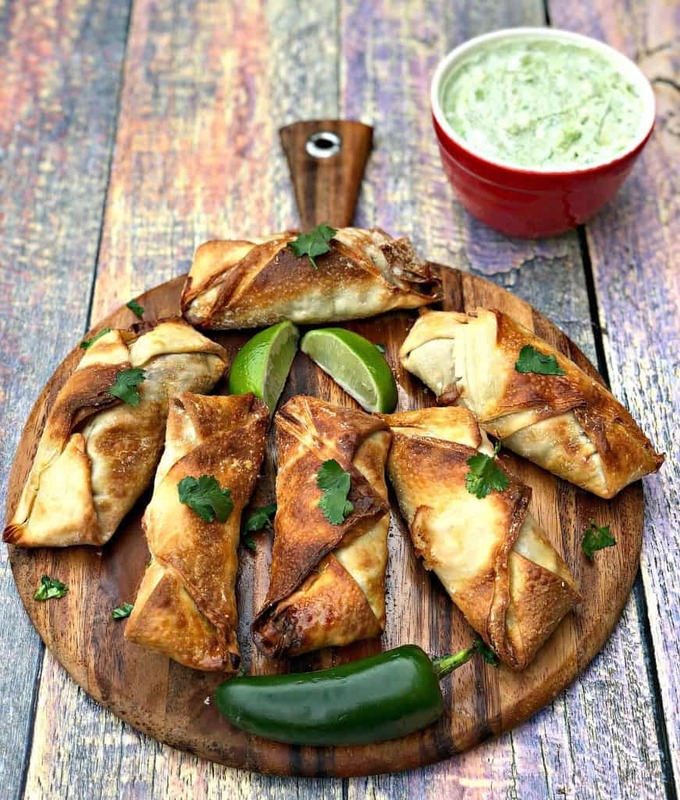 Drizzle the fresh lime juice throughout. Add the cilantro and taco seasoning. Stir. Lay the egg roll wrappers on a flat surface. Dip a cooking brush in water. Glaze each of the egg roll wrappers with the wet brush along the edges. 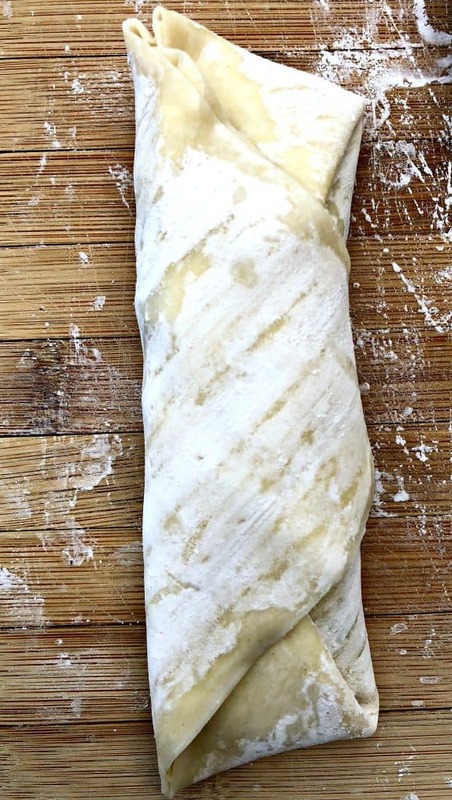 This will soften the crust and make it easier to roll. Use 2 egg rolls for each. I chose to double roll the egg rolls to prevent them from leaking. If the brand of egg roll wrappers you purchased is pretty thick, you may only need one wrapper and no need to double up. Load the mixture into each of the wrappers. Fold the wrappers diagonally to close. Press firmly on the area with the filling, cup it to secure it in place. Fold in the left and right sides as triangles. Fold the final layer over the top to close. Use the cooking brush to wet the area and secure it in place. Spray each egg roll with cooking oil. Load the egg rolls into the pan of the Air Fryer. Spray with cooking oil. Cook for 8 minutes at 380 degrees. Flip the egg rolls. Cook for an additional 4 minutes. Cool before serving. Peel the avocado and remove the pit. Mash the avocado in a bowl. I like to use a potato masher. Add the sour cream and ranch seasoning. Stir well to combine. If this recipe list looks long and overwhelming, trim down some of the ingredients! I love colorful egg rolls, especially for serving while hosting. 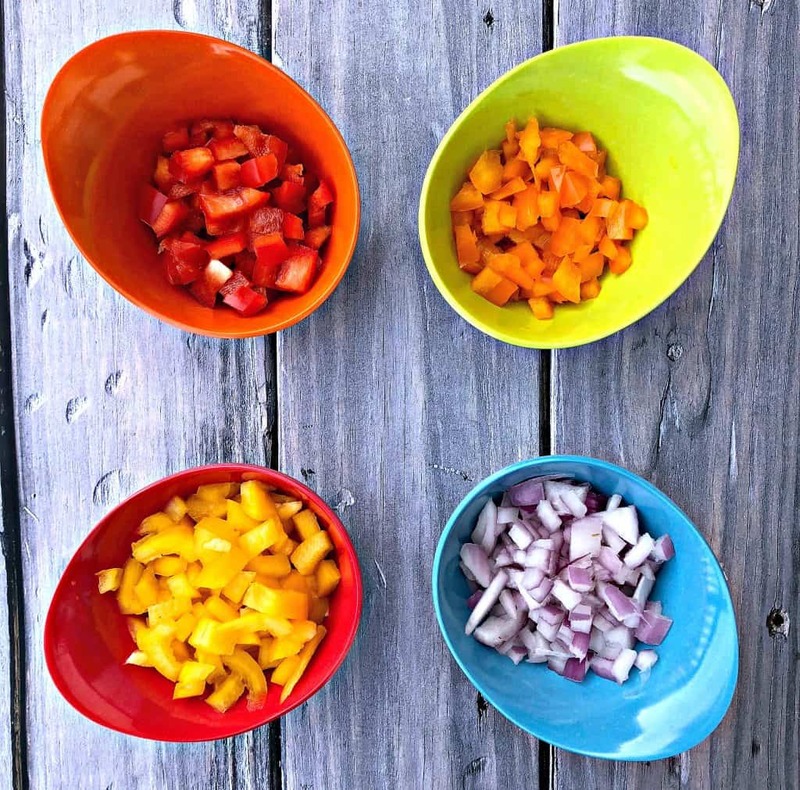 Feel free to omit the multi-colored peppers if you aren't into them. If you like really crispy egg rolls, cook them for 4-5 minutes longer than the timing noted above. Use your judgment. 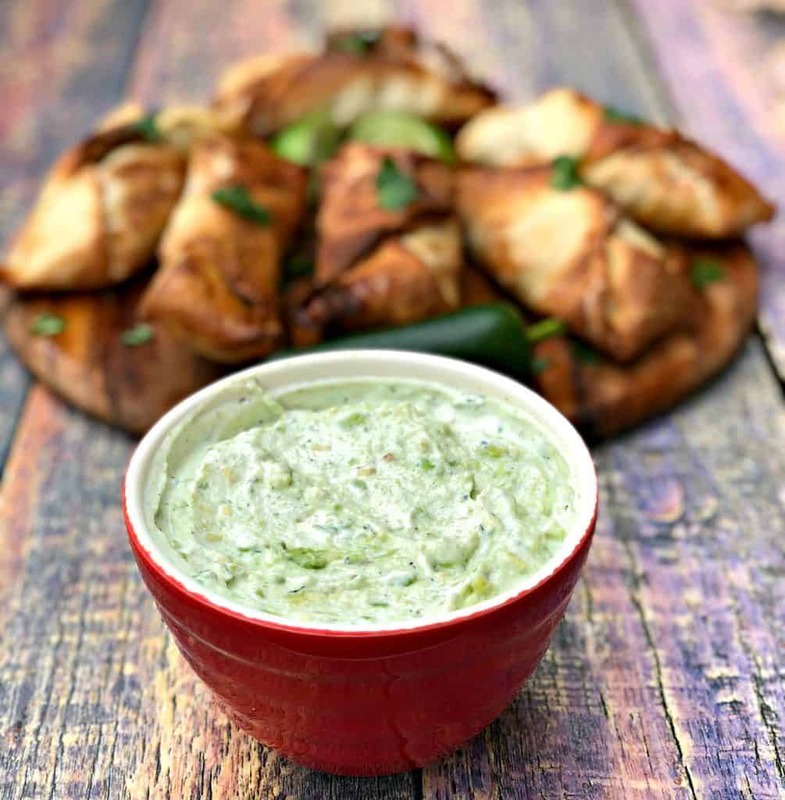 Taste your avocado ranch dip after preparation. Determine if you feel you need to use the full packet vs half of the packet. Feel free to add jalapenos to this recipe for added spice! The Trader Joe's Taco Seasoning noted above has a small kick to it. If you want cheesy egg rolls, add more cheese than what is listed in this recipe. I would recommend adding it to the egg roll after you have loaded in the veggie mixture, right before sealing. Ok this looks amazing! What a great appetizer and my family would absolutely love it! I have never had an egg roll!!! But I love chinese spring rolls and these do remind me of those. So will have to give them a go soon! 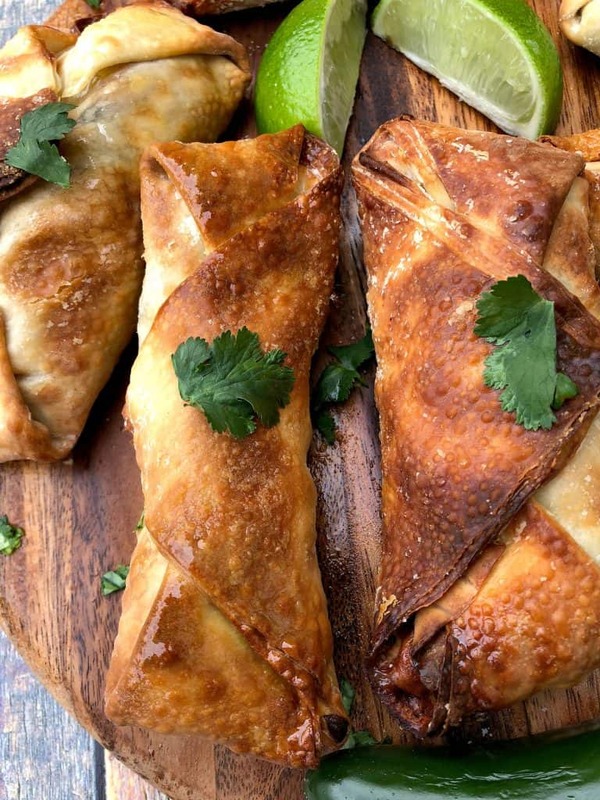 I’ve never had a southwestern egg roll, but these sound delightful! I could make a meal of them. WOW! Now I NEED an air fryer! GOSH – such gorgeous spring rolls – without any of the added calories of actually fried ones! These sound great. What temp for the air fryer please? What an amazing recipes you always put on your website. Do you really make them yourself? What setting did you use on the fryer? Bake or fries? My air fryer only has 1 setting. If yours has multiple, I would assume you should use fry for these. These look soooo good!!! Could these be made in advance and frozen before cooking in the air fryer? Cook them in advance using the air fryer and then freeze them for later.